The transition to a rigid flex design from the traditional approach of using cable assemblies to join two or more PCB’s, has obvious benefits – space, weight, packaging, reliability and increased currently carrying capabilities – yet many times the perception that rigid flex is a high cost solution, causes designers and engineers to hesitate. We are often asked for our thoughts on how to compare the cost of a rigid flex design with the more commonly used rigid PCB and cable technology. The answer is more complicated than simply comparing the bare board cost of the rigid PCB to the rigid flex. The rigid flex will almost always be more expensive. 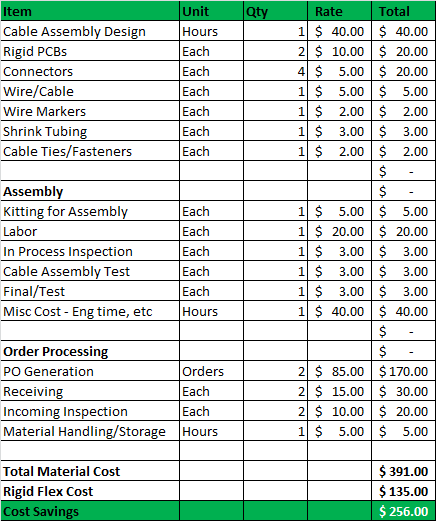 Reviewing the overall total cost of assembly for both approaches provides a more accurate comparison. Recently, Elizabeth Foradori and I sat down to discuss this topic. Our discussion should not be taken as an all-inclusive list of items to be considered, every application is unique. Our hope is that this discussion helps facilitate the thought process when doing a comparison of the two technologies. To listen to the discussion, click here. Following are some of the highlights from that discussion. Cost of design: You are merging multiple boards into one design, only one design is needed with a rigid flex. Often with a rigid PCB/cable solution, multiple PCB designs and multiple cable assembly designs are required. The costs for generating each design should be calculated and included when doing a cost comparison of both solutions. Cost of cable and connectors: It is very common for someone to compare the cost of the rigid PCB’s with the rigid flex and come to the conclusion that rigid flex is too expensive. The cost of the cables and connectors should also be factored in. The rigid flex cost should be compared with the all of the components of the PCB/cable solution including: PCB’s, connectors, wire and cable, wire markers, shrink tubing, cable ties and fasteners and freight for all of these components. Cost of the assembly operation: A rigid flex solution requires only one assembly while the PCB/cable solution can require two, three, or even more individual boards to be assembled. The total cost of the assembly process needs to be considered when making the comparison. This will include items such as: the cost of kitting for assembly, labor, in process inspection, cable assembly test, final test, PCB tooling and test, and the costs associated with the engineering time required for each of these operations. Cost of testing: Not only does the rigid flex solution only require one test operation, it also provides the ability to test the full assembly prior to installation. Cost of order processing: The costs associated with processing the order are very often overlooked. As stated earlier, the rigid flex is one unit, while the PCB/cable solution contains many different components to create the final unit. Each of these items has costs associated with purchase order generation, receiving and incoming inspection, material handling and storage, and payment processing. Logically, it is easy to agree that working with a single rigid flex design rather than the multiple components of a PCB/cable solution does simplify things. The big question becomes, does it save enough time and cost to justify the transition to rigid flex technology? As mentioned, this list is not intended to be all inclusive, but to provide a basis for further discussion when looking at comparing the cost of rigid flex technology with the PCB/cable solutions. Rigid flex technology is a growing aspect of the PCB market. As electronics becoming increasingly smaller, the space, weight and packaging (SWaP) benefits of rigid flex technology are more in demand. Rather than simply comparing the cost of the individual rigid pcb’s with the cost of the rigid flex, analyzing the total cost of assembly for both solutions may enable designers and engineers to justify the transition to rigid flex technology to take advantage of these benefits.